Eric Hawthorn annoyed his mum by using ferric chloride to etch circuit boards to feed his schoolboy fascination with electronics – especially when it splashed on to the furniture. But I bet she’s forgiven him. 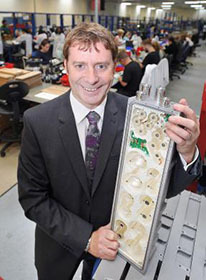 Radio Design, the Shipley-based company he launched in 2007, has grown in double-quick time from the original 11-strong team to employing nearly 200 people – and Eric envisages it could have 1,000 or more in the next five years. He’s taken a hobby interest to a pioneering business developing and making components for mobile telecommunications operators. “I developed a fascination with electronics and especially mobile communications at an early age. I studied magazines and tried to come with new ideas,” said Eric, who was born in Glasgow.